Businesses: read on for FREE help with your Facebook marketing! If your business is a good fit for Facebook marketing, you can now help your messages go viral by getting people to share them on their Facebook pages. So instead of paying for individual views or clicks, you pay one time for each "Share" you want. 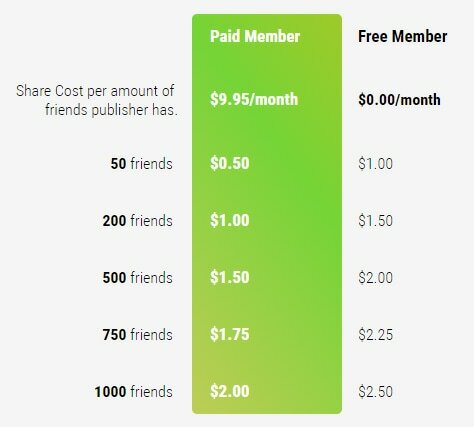 The cost is just $1.00 to $2.50 for every share on a REAL person's Facebook page, depending on their number of friends. Or upgrade to a premium account for just $9.95 per month to save 50 cents per share -- ideal if you plan to purchase at least 20 shares each month. ​You can even target WHO shares your post ... by location and other demographics. So you can get the RIGHT people sharing your message. Unlike services I've seen elsewhere, this one verifies each Facebook account and its number of friends. It verifies their LOCATION in case you want to only market locally or nationally (rather than around the world). It RE-verifies both of these each month and makes sure they're not increasing too quickly in their number of friends (to keep you from spending on spam accounts). Your message must be shared as "Friends" or "Public" to keep you from spending money on Shares that will never be seen. Each Share is kept live for a minimum of 72 hours or you pay nothing. Those sharing your message have CHOSEN to share it. They are not forced to by this service. While the person sharing your message is not necessarily endorsing your business, there is a sort of perceived endorsement because they are sharing it on their personal page. This calls on the power of word of mouth marketing. This service is called PennyPays. It is free to join in order to purchase Shares. Other members are then paid if they choose to share your posts, but they remain in control of which posts to share. Obviously as a business you do not need to share other people's posts (for pay) if all you want to do is advertise.